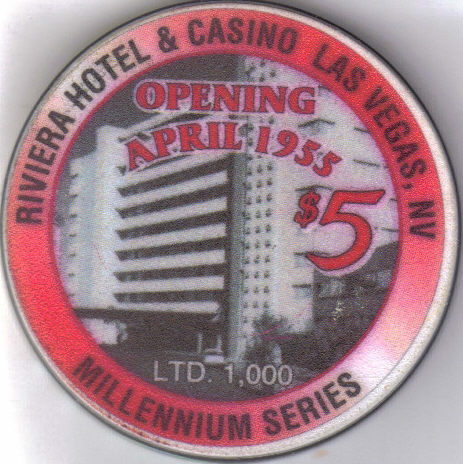 Item for sale: (1) authentic, obsolete 5 Millennium Series Limited 1000 Casino Chip made by the RIVIERA Hotel Casino, Las Vegas, NV for their Grand Opening April 1955 featuring the original building on both sides of the chip. Chip measures 1-1/2" in diameter, Used/Circulated Send email if you need additional details about this chip. Buyer is responsible for 3.95 for postage and handling within the USA. International shipping rates apply. Shipping always combiend on multiple purchases. Don't forget to check my store for many more Las Vegas Collectibles! Thanks for stopping by!